Spent 3 days on the lease hunting for deer and pigs. Deer was OK, lots of sitting, but pigs were fun. We would walk about in the night and call them with a distress call. We stirred up a real big one that was quite mad with us. Kind of a weird feeling to be walking throughout the brush in the middle of the night and come upon a hog hole, full of mud and hear them circling you. We shot one pig and it was strange to have the other pigs surround it and protect it. We were unable to get to the pig we shot, what with the others protecting it. All and all it was fun hanging out with some dusty Mexicans. 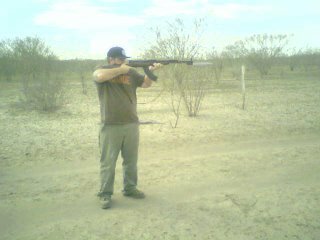 A quick picture of me unloading a 35 round clip in the semi auto SKS assault rifle. Is that a knife on the end of the gun?? Did you stab anything? So you killed the pig...left his friends and relatives to cry over his wounded dead body and you didn't even take him home and eat him?? Are those pigs mean? Would they have attacked you or anything while they were circling you? About how big was the pig? Weight? BTW...I HAVE shot an M-16 or M-18 ...I can't remember what 'number' it was. But it was incredible experience. Such a powerful weapon. My father was a competitive pistol shooter. Very good at it actually. I've always wondered if I have a hidden talent I don't know about. ha! So you're saying you can handle a mighty weapon? We shot the pig, and yes they are VERY aggressive with large tusks, and he was imeediatley surrounded by his friends and relatives. We were not about to venture into a pack of wild javelina for the dead one. We went back the next day to try and retrieve it, but it was already gone.